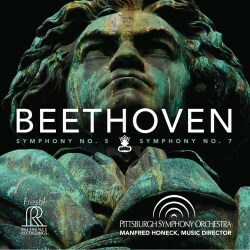 This new Beethoven release from the Pittsburgh Symphony Orchestra under music director Manfred Honeck is the fourth in Reference Recordings ‘Pittsburgh Live’ series. Honeck has at his disposal one of the world’s finest orchestras. I still recall an account of Olympian majesty they gave of Mahler Symphony No. 5 at the Philharmonie during the Berlin Musikfest 2011 2011 on the 10th anniversary of the 9/11 terrorist attacks on the World Trade Center. Commenced in 1800 Beethoven’s epic cycle of nine is revered as the composer’s greatest legacy to music culture with each symphony inhabiting its own individual world. Honeck explains “the name Beethoven holds an unbelievable fascination - and this is undoubtedly true for conductors who encounter all nine of the symphonies in the course of their own careers.” With such an outstanding choice of complete Beethoven cycles in the record catalogue it is difficult to settle on one specific set. There are a few conductors who have recorded more than one cycle with Karajan having recorded four. The complete sets that I reach for most often are from the Berliner Philharmoniker/Claudio Abbado on Deutsche Grammophon; Berliner Philharmoniker/André Cluytens on EMI; Wiener Philharmoniker/Karl Böhm on Deutsche Grammophon; Berliner Philharmoniker/Herbert von Karajan on Deutsche Grammophon (1961/62 cycle) and the 2013 release from the Symphonieorchester des Bayerischen Rundfunks/Mariss Jansons on BR Klassik. Scrupulous by nature this conductor has also made serious study of these works making a number of small modifications in these readings. Interestingly he notes that in recent years there have been relatively few recordings released in the USA of these two symphonies. Honeck has researched the last time the Pittsburgh Symphony Orchestra recorded the Fifth Symphony which was in 1965 and the Seventh Symphony even earlier in 1962 both under William Steinberg. Using a large orchestra one senses an elevated level of musical intelligence together with an unyielding structural coherence that produces impressively selected tempi, dynamic contrasts and moulding of phrase. These are mightily compelling performances, buoyantly rhythmic with plenty of thrust when required. Striking too is the penetrating lyricism and level of emotional intensity. The full bodied tone of the brass registers strongly as does the unified strength and expression of the strings especially the rich, dark timbre of the cellos and basses so crucial in providing a rock-solid foundation. Completed in 1808 the manuscript score of Symphony No. 5 in C minor is inscribed with a dedication to both Prince Lobkowitz and Count Rasumovsky. The English novelist E.M. Forster wrote of this work “the most sublime noise that has ever penetrated into the ear of man” and for good reason. Ever since its 1808 première in Vienna it has remained one of the most enduringly admired works of classical music. This live recording is fresh, incisive and authoritative. Marked Allegro con brio in the heroic opening movement the Pittsburgh players are bold and exhilarating with no want of biting intensity. One of my favourite movements in all Beethoven symphonies is the gloriously romantic Andante con moto in which Honeck displays splendid rhythmic control, painting a beautiful compassionate mood, revealing a slightly sorrowful undertone. Honeck brings the same level of spine-tingling engagement to the slow movement as his fellow countryman Karajan and his Berlin players in their 1962 Jesus Christus Kirche, Berlin account on Deutsche Grammophon. The third movement Allegro feels bold and highly spirited and the triumphant Finale: Allegro overflows with dauntless drama together with a martial swagger. The Symphony No. 7 in A major and the Symphony No. 8 in F major were both completed in 1812. Dedicated to Count Moritz von Fries the Seventh enjoyed great success at its 1813 première in Vienna. It was Wagner who famously described the symphony as the “apotheosis of the dance.” In Honeck's assured hands the extended opening Poco sostenuto - Vivace is irresistible in its compelling buoyancy and heroic power. There is an austere beauty to the much admired Allegretto together with a sacred feel to the undertow. Infectious is the sense of uplifting joy afforded to the dance rhythms of the Scherzo. The bold and unruly Finale is magnificently uplifting and moves forward with unrelenting energy. No matter how much drama Honeck and his Pittsburgh players give I have yet to hear a performance to equal the dramatic intensity that Wilhelm Furtwängler and the Berliner Philharmoniker gave to their live recording from October/November 1943 at the (Alte) Philharmonie, Berlin. In the booklet a twelve page essay ‘Looking Behind the Notes’ by Manfred Honeck is a most fascinating read providing considerable insights and detail from the conductor’s perspective. On this hybrid SACD played on my standard unit I am delighted with the sonics provided by the Soundmirror recording team. There is excellent clarity and considerable detail is revealed with good presence and balance. Outstandingly performed and recorded this special Reference Recordings release can sit comfortably alongside the finest recordings in the catalogue.